Gelsemium sempervirens is the most widely grown of this useful group of plants, a climbing evergreen plant with trumpet shaped yellow flowers, it is suited to grow against a wall or in a container. It is the combination of the brilliant yellow flowers and glossy green foliage make this a landscaping plant suited to a range of applications. Deep green glossy foliage and good fragrance when in flower make this a popular garden plant. 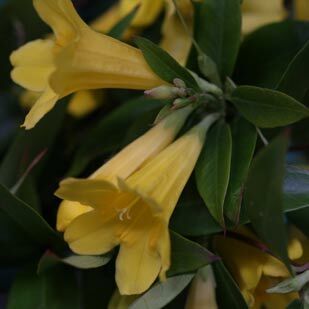 Also known as the Carolina jasmine, Gelsemium sempervirens is also offered in hanging baskets by some wholesale growers. Grow in container, hanging basket or as an informal hedge. Yellow flowers from spring to summer.